Simplicity is sometimes elusive, but almost present. Sometimes you just need to know where to look for it, or how to look for it. Luckily, in our Hindi cinema, we had film makers like Hrishikesh Mukherjee, Basu Chatterjee, Gulzar, Basu Bhattacharya, Sai Paranjpe and few more, who dared to make films with simplicity as its basic ingredient. Despite of making such simple tales, these filmmakers highly focused in the entertainment factor and kept their audience entertained. In recent times, we did see some more film makers like Rajkumar Hirani, Priyadarshan, Rajat Kapoor, Sharat Katariya, Vikas Behl, Nittin Khakkar, Sagar Ballary, Amol Gupte and many such film makers venturing into the simplicity zone and emerged out on a victorious note. Along with these directors there were some particular actors who can slide easily inside the skin of their simple characters. Actors such as Amol Palekar, Farooq Sheikh, Naseerudin Shah, Manoj Bajpayee, Irrfan Khan, Nawazuddin Siddiqui and a few others including Rajkummar Rao are known for their versatility. Rajkummar Rao comes up with yet another simple tale featuring simple people from a heartland of India in the form of ‘Behen Hogi Teri’. 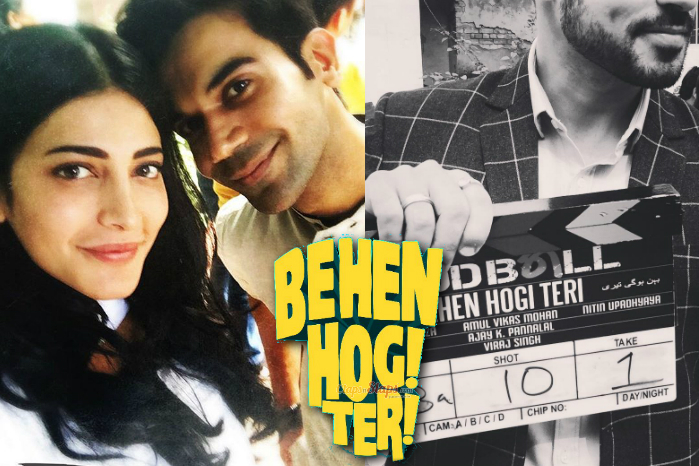 So, let’s find out whether ‘Behen Hogi Teri’ will manage to fulfill its promise by giving us a sweet feel good film or might end up being one more product based film with just a one line novel idea. ‘Behen Hogi Teri’ is a story of Gattu (Rajkummar Rao), who right since his childhood is head over heels in love with his neighbor Binny (Shruti Hassan). Sadly, Gattu’s father (Darshan Jariwala) believes that every girl from their area is like Gattu’s sister. At the same time Binny’s elder brother Jairam (Ninad Kamat) and all other family member’s treat Gattu as Binny’s additional brother. One fine day Gattu expresses his feelings to Binny. After a series of tests, Binny agrees to Gattu’s proposal. But, before Gattu and Binny could share about this to their respective families. Gattu’s father and Binny’s brother misunderstand Gattu’s best friend (Herry Tangri) as Binny’s lover and what happens next is what the entire film is all about. The story is different and has been presented in a breezy manner. Dev Anand’s ‘Bombay Ka Babu’ and Amitabh Bachchan’s ‘Zameer’ had mild, similar situation, where the families considered hero as an additional brother of the heroine, but again these films had a different theme and the whole presentation was totally different. In case of ‘Behen Hogi Teri’, it’s more of a love story set against the backdrop of conservative families leading to a chaos. The first half of this movie is totally hilarious and highly entertaining. There are many rib tickling scenes such as the opening scene of force Rakhi ceremony leading to Rajkummar Rao’s introduction of Shruti followed by the entire track of Shruti’s grandmother’s death followed by Rajkummar trying to become friendly with Shruti, Shruti testing Rajkummar’s guts, Darshan Jariwala and Ninad Kamat’s track, Darshan trying to make Shruti as Rajkummar’s sister, Herry Tangri track and many more in the first half of the film. The writers, actors and director keep your smile intact in the first half of the film. The grandmother death track might remind you of the death scene from the Kamal Hassan’s classic film ‘Pushpak’. Sadly, the movie slows down drastically in the second half of the film. The entire family feud track seems fantastic on papers, but on screen looks forced and stretched at several times. The pace of the film also keeps dipping at regular intervals. 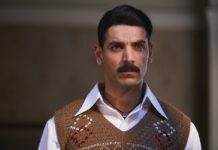 The fun element is restricted and shines only in few scenes such as Rajkummar and Herry drunk bashing romantic films, Rajkummar reading letters to Gulshan Grover and Shruti’s family and a couple more. There should have been many more such scenes in the second half of the film. The confusion based comedy starts on an entertaining note, but gets repetitive after a while. Despite of these loopholes, ‘Behen Hogi Teri’ shines out mainly due to its amazing dialogues, superb nuances, local dialect, mannerisms and all those minute details. The cinematography by Shamsher Singh manages to keep the mood of the film intact. The music of this movie is not that great. ‘Tera Hoke Rahoon’ is melodious and rightly used in the film. Sadly, the rest of the songs are badly placed and abrupt at times. The remix version of ‘Jaanu Meri Jaan’ in the end credits is totally unwanted. The background score on the other side is fantastic. Director Ajay K Pannalal highly succeeds in giving us a simple, entertainer which highly reminds us of the film made by Basu Chatterjee. He keeps the humour quotient intact and extracts some fine performances from a few of his actors. It’s just that in order to enhance the story, he ends up losing the basic flavor of the film. The second half fails to do justice to the hilarious first half of the film. The finale track could have been more engaging as well as entertaining. Nevertheless, the movie will end up being as a good watch on home video. Rajkummar Rao is highly exceptional in his role. His expression in the grandmother’s death track followed by his bonding with Shruti is priceless. You can feel his happiness as well as the stress he carries in his heart. This guy knows the secret of getting the simplicity factor in his performance and outshines many of his contemporaries in terms of acting. Shruti Haasan look good in some scenes and lends decent support. It’s just that one cannot avoid getting distracted by her badly enhanced lips. The makeover does not gel with her character. Darshan Jariwala is outstanding in his part. 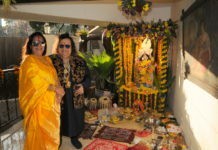 Ninad Kamat, Herry Tangri and Gulshan Grover lend good support. Ranjeet is wasted. Gautam Gulati overacts. So on an overall basis, ‘Behen Hogi Teri’ is a rollicking tale which works mainly due to its simple theme, fine performances and hilarious situations. Sadly, the pace and jumbled up second half dilutes the impact of the film.